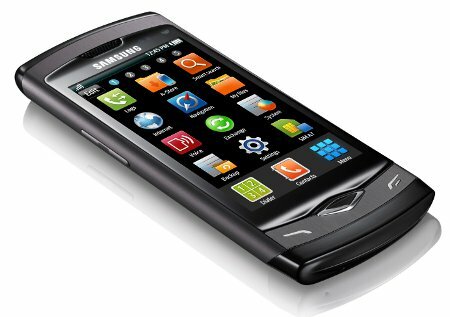 The first bada phone, the Samsung Wave, was somewhat of a trailblazer for the company. Being the handset where theSuper AMOLED screen technology, and the1GHz Hummingbird chipset made their debut, it will always have a special place in our techy hearts. Samsung needed a smashing phone to get the word out about its own mobile OS bada to the world, before it puts the same technologies into the Galaxy S, with the much more popular Android, that was sure to steal the spotlight. The Samsung Wave II is way bigger than its predecessor, in every way but the silicon. Not that we expected the Hummingbird chipset to be replaced with something else here, as there is nothing better with one core - even NVIDIA Tegra 2 barely equals it in the graphics department. The phone’s screen has grown in size to 3.7”, quite larger than the 3.3-incher on the Samsung Wave, which brought along an increase in all three spacial dimensions. It is a quite respectable handset now at 4.88x2.35x0.46 inches (123.9x59.8x11.8mm), with the more palpable 4.76oz (135 g) of weight. To be frank, the original Samsung Wave looks spectacular, but is made for smaller hands - it is so thin, that only the metal casing prevents it from being lost in our grubby mitts. Samsung Wave II keeps the aluminum chassis, but we welcome the growth in size and thickness, which makes it easier to handle, if you have bigger hands. It is still a looker, actually it looks almost the same as its founding father - same metallic color and same diamond-shaped opening for the 5MP camera lens on the back. The only differences are the middle menu key beneath the screen, which is a flat inverted trapezoid now, rather than the protruding diamond-shaped key before. The handset is now also offered in four colors – ebony gray, white, pink and black. The screen part is also completely flat, not slightly recessed at both ends like on the Samsung Wave. And here comes the biggest surprise - instead of a bigger, brighter Super AMOLED screen, the 3.7-incher is of the Super Clear LCD variety with the same 480x800 pixels of resolution. Oh, well, we guess Sammy was hit by its own Super AMOLED supply problems here. Don’t get us wrong, the display is still one of the best the LCD technology can offer in terms of sunlight visibility, color gamut and viewing angles, but the punchy, oversaturated colors, and almost infinite contrast of the Super AMOLED will be missed regardless. The lack of an ambient light sensor to automatically adjust the screen's brightness is a letdown. Overall, in the Samsung Wave II the design centers around the larger screen size, making the handset taller, thicker and more solid to handle with our paws. It keeps all the elements of the original’s chick appearance, like the brushed metal body and laser-etched branding. We are especially pleased that the screen lock is comfortably placed on the right side, so we won’t have to look for it at the top every time we want to check the hour of the day, like with so many handsets lately .